Rock fins up to about 1 foot (30 centimeters) tall dominate this scene from the panoramic camera (Pancam) on NASA's Mars Exploration Rover Opportunity. This image was taken Aug. 23, 2012. The Mars rover Opportunity is currently exploring a location known as Cape York along the western rim of a giant Martian crater called Endeavour. Opportunity is one of two golf cart-size NASA rovers that landed on Mars in January 2004 (Spirit was the other) to explore different landing sites. The solar-powered rovers were initially expected to last just 90 days on Mars, but each survived for years on the Red Planet. Spirit stopped communicating with Earth in 2010, but Opportunity is still operational. Despite its advanced age, Opportunity is still pumping out new discoveries after more than eight years on Mars. The rover first spotted Martian blueberries soon after its landing in 2004. The blueberries are actually concretions created by minerals in water that settled into sedimentary rock. 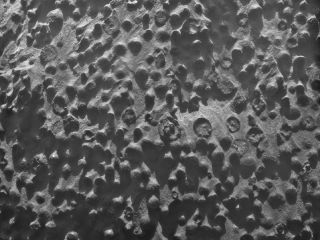 Opportunity has seen Martian blueberries at many of its science sites during its Red Planet exploits, but the bumpy, spherical formations on the Kirkwood rock represent something new, researchers said. In Opportunity's new photo, many of the strange features are broken, revealing odd concentric circles inside. Squyres said he and his science team have several theories, but none that truly stand out as the best explanation for what could have created the weird bumps on Mars. "It's going to take a while to work this out, so the thing to do now is keep an open mind and let the rocks do the talking," he said. The Kirkwood outcrop is just one science pit stop at Cape York for Opportunity. Mission scientists have already picked out another interesting rock outcrop nearby, a pale patch that may contain tantalizing clay minerals, for possibly study after Opportunity completes its current analysis. Meanwhile, the spring equinox is approaching on Mars, ensuring increasing levels of sunshine for Opportunity's solar arrays. "The rover is in very good health considering its 8-1/2 years of hard work on the surface of Mars," said rover project manager John Callas of NASA's Jet Propulsion Laboratory in Pasadena, Calif., in a statement. "Energy production levels are comparable to what they were a full Martian year ago, and we are looking forward to productive spring and summer seasons of exploration." While Opportunity explores the plains of its Meridiani Planum location, NASA's Mars rover Curiosity is poised to resume driving toward its first long-distance destination inside Gale Crater. The rover, which has completed its final health checks, is headed for a site called Glenelg near the base of the 3-mile (5-kilometer) Mount Sharp, a mountain that rises from the center of its Gale Crater landing site. Curiosity landed on Mars on Aug. 5 and is expected to spend two years studying Gale Crater to determine if the region could have ever supported microbial life.